Though the St Andrews Hundred Hole Hike was months in the planning, the reality didn't hit home until I saw my name at the very top of the Old Course ballot. I was wrapping up my fourth and final leg of this 17-day adventure with 100 holes at the Home of Golf. On the 4th of July. With arguably the world's greatest living golf-course architect (and personal favorite) Tom Doak? How the heck did this happen? This was more than just a golf event for charity; it was like a golfclubatlas.com fantasy camp experience. Just getting on the Old Course ballot in the first place is tough enough. The process seems to be a deeply shrouded secret. Getting out as the first group on the Old...that was a dream come true. My friend and fellow hiker Josh was the point-person in organizing the hike. He's worked with the University of St. Andrews over the past few years and has close contacts with the Links Trust. The Links Trust set up a great plan to get us to 100 holes. First, an early start at the 9-hole Balgove, then the aforementioned Old Course, then over to play the Eden and Strathyrum (I still can't pronounce it correctly), then rounds on the Jubilee and the New Course. Those are the six courses managed by the Links Trust that are in the middle of town (the Links Trust recently added the Castle course just outside of town, but that wasn't on our agenda). The in-town courses got us to 99 holes -- the plan was to finish late in the day with the first hole of the Old Course to get the group to an even 100. Rounding out the foursome was David Watt, an instructor for the Links Trust and the golf coach at the university. Both Josh and he were raising money for a new golf scholarship at the school, named after CB Macdonald. Throughout the day, David had honors off the tee by default, and showed us other hacks the general path to follow. Of course, the star of the show was Doak, recent Michigan Golf Hall of Fame inductee, noted author and arguably a member of golf course architecture's Mount Rushmore (discuss amongst yourselves). 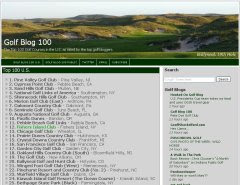 Doak counts six world Top 100 courses to his credit: Pacific Dunes, Barnbougle Dunes, Cape Kidnappers, Old Macdonald (w/ Jim Urbina), Ballyneal (boom!) and Sebonack (site of the recent US Womens Open, co-designed with Jack Nicklaus). I leaned on Tom about hiking back in January, joking that he was contractually obligated to participate as the 2012 Walking Golfer of the Year. Honestly, it didn't take much arm twisting. I've found Doak to be very supportive of charitable golf efforts, particularly those that expose our great game to young people who might not otherwise get the chance. For example, his firm built a three hole practice course in inner-city Detroit, and he donated a prize in the fundraising auction we did for the Midnight Golf program there. CommonGround in Denver was another huge success story, turning a nondescript former Air Force course into arguably the most fun public tract in Denver. Like me, Doak decided to hike for the Solich Caddie & Leadership Academy at Common. A hike at St. Andrews was also a big selling point for Doak. As part of a grant he received from Cornell to study the world's great old courses over 30 years ago, he caddied at St Andrews for a couple months and spent a good chunk of that time picking the brain of the old superintendent. The Home of Golf holds a special place in his heart, with the Old Course as the origin for much of his design ethos. An interesting sidebar to the hike at St Andrews were the recent changes made to the Old Course, designed to protect against someone shooting a 59 in the Open Championship held there once every five years. Bunkers were moved and contours were altered and the famed Road Hole bunker was modified in the first grand scale changes to the course aside from lengthening in nearly 100 years. The changes were covertly announced the day after Thanksgiving by the R&A and started immediately after, with little opportunity for public debate on the need for such changes. Many likened the changes to painting a mustache on the Mona Lisa (a phrase R&A Chief Executive Peter Dawson himself used to describe new tee boxes added in 2002). A #savetheoldcourse twitter campaign was launched (by me) and gained some steam. Purists argued that instead of carving up these cathedrals of the game, why not finally slow down the golf ball and/or equipment? While most architects toed the company line, Doak was the most outspoken against the changes. He wrote letters to industry groups, architectural societies and an open letter to the people of St Andrews, who are the true owners and stewards of the Old Course. Including Doak in the hike here might have been viewed as a controversial decision in some circles. I imagined #savetheoldcourse picket signs, him staging a lock-in in the new Martin Hawtree bunkers on the second hole, or me offering a shoulder for Doak to cry on upon seeing the changes made to the famed 11th green. Thankfully, the event went smoothly and without issue, and seemed to be a huge success for everybody involved. For me, the entire day seemed like one supersonic blur. We met up at the Balgove course at 5:00 am on Thursday, Josh and I pulling up in my rented Peugeot speedster with the worst GPS system known to man ("They heard he plays fast, so they gave him a sports car," Doak remarked. My knuckles were too white from driving on the other side of the road to actually enjoy it, and mostly deferred to Josh to drive.) David parked on the other side of the lot, and Doak surfaced from the early morning fog carrying a Mackenzie bag with the only six clubs he brought across the Atlantic. Five minutes later, we were hitting our first tee shots of the day. Playing speed golf in a foursome and without caddies was a new experience for me. Playing 100 holes in a day was completely new for my playing partners. We didn't really have a game plan for day, we just kind of settled into a rhythm by trial and error. Doak struggled with the pace for the first few holes and made some big numbers. I failed to get the golf ball more than five feet off the ground, but it was going in the right general direction. The Balgove is a 9-hole practice (or practice) course designed for families and beginners, and as a par 30 with some 245-yard par 4's, would normally be ripe for some birdie or eagle bonuses if we weren't skunking it around so much. As expected, David led the way with one birdie and a 31. I had a 34, Josh had 38 and Tom brought up the rear with a 41, but with one birdie. The 9-hole round took us 42 minutes to play. From there, we zipped over to the famed Old Course for our main event. We arrived 20 minutes ahead of time, and a number of golfers had assembled near the starters hut to fill in open spots on the day's tee sheet. We strutted confidently towards the first tee, knowing we were in extremely rare company with a 6:20 tee time, ten minutes before the normal first time. Standing on the one of the most famous first tees in all of golf, I was quickly reminded just how big our little grassroots efforts had grown. I repeat...how the heck did this happen? To top it off, while standing on the tee, three different people approached our group and asked, "which one of you is Jim Colton?" Two of the guys, Ben and Andy, we're GCAers. Ben works as the starter, Andy was visiting from DC on a golf trip. The third guy was Allan, who brought a large bag with breakfast for each member of the group, courtesy of Herb Kohler and the Hamilton Grand building beyond the 18th green. Finally I brought some value to the foursome, even if it was just free bacon sandwiches and coffee. Rounding out the entourage were Chris, who overheard Josh talking about the hike at a pub the day before and asked, "wait...Jim Colton is here?" and Simon, a friend of Tom's and, from what I could tell, Scotland's reigning Mr. Congeniality. Simon came to caddie for Tom on the Old Course and ended up sticking around for half the day -- he probably would've sucked around for all 100 if his wife hadn't been 8.97 months pregnant. We all hit our opening tee shots -- Tom finding the burn down the right side, my worm burner ran a good 220 yards (fescue!) and finished just short of the water, and our posse set off down Broadway (how many golf blogs can work in a pre-"Baby Got Back" Sir Mix-A-Lot reference?) Chris immediately grabbed Josh's bag and headed down the fairway. About 100 yards off the tee, Andy looked back at me dragging my bag and reluctantly offered to take it, like I was the last single bridesmaid left at a wedding reception. Just like at Balgove, my swing tempo was way too fast and I could barely get the ball airborne. I didn't find much trouble though, and managed to score well. The last (and only) time I played the Old Course back in 2000, my wife and I waited at the starter's box for five hours in 45-degree temps. Once I finally got out, I promptly double-bogeyed the first five holes. Here, I started out with five 5's, then rolled in a birdie putt on 6 and drove the green on the 7th to within 15 feet of the pin -- except it was the pin for the shared 11th hole. A three-putt par from 180 feet, followed by two 4's on 8 &9 and I had made the turn in a respectable 40. If I could match the 37 I shot on the back nine in 2000, I'd have something to brag about. Not so fast. We made the turn and my fortunes took a dramatic turn for the worse. It all started innocently enough on the 10th, as I hit a seemingly okay approach shot that just ran through the green. Instead, the ball got hung up in the tall grass, with my stance leaving the ball at sternum-level. I had to step up a small ledge to determine where my ball was, then step back down and blindly swing where I thought the ball was. As you might expect, this did not end well. It turns out, I probably should've just played my tee shot on the 7th into the 11th hole and just finished in from there. When I played the hole for real, a slappy 7-iron found the Strath bunker and everybody else in the group instantly groaned. "Your over/under is five from there," Simon remarked. "Or six," Tom quickly chimed in. I hate it when Tom is right. The rest of the back nine was like a grand tour of all of the mysterious bumps, hollows and hazards of the Old Course. 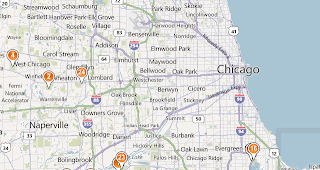 All of those bunkers that look like they are there for no particular reason at all? Well, I discovered the very reason: to add numerous strokes to my score on July 4, 2013. The clotted cream in the tea was the famed Road Hole. There are a lot of golf holes in the world, but only a handful of Once-in-a-Lifers -- holes that you think about months in advance with shots that you really don't want to screw up. The 16th at Cypress Point probably takes the cake, but other examples include the 17th at Sawgrass, 12th at Augusta and 18th at Pebble Beach. The Road Hole has to be the Par 4 representative in this pantheon. Golfers would give up their partner's right arm for just one divinely-intervened swing that propels the ball over the shed and around the corner. Everything else in the round is secondary. Unfortunately, this is doubly true for bad shots. I'm still haunted by my duck hook into the Pacific at Cypress three years ago. And I will now be tormented by the following topped shot that went a grand total of ten yards on the greatest par 4 on the planet. Unfortunately, it didn't get much better from there. I managed to hack my way out of the tall rough, then played cautiously up the right side of the hole. My fourth shot ran through the right side of the green and ended up on the clay path between the green and the Road. I then tried to play a touch shot from the path, but left it short and on the bank of the green. To this point, I had played 474 1/2 holes with a wide assortment of scores, but had yet to make a single quintuple bogey. One chip and three putts later and that streak was o-va. Add another three putt on the home hole for good measure, and my final tally made me want to pull a Bobby Jones and rip my scorecard to shreds: 40-55 95. Tom kept the party going by hitting the flagstick with his second shot on the par 5 5th, leading to a routine birdie, then rolling in a 15-footer for birdie on the short par 3 8th. This. Doak. Is on Fire!!! That could be a song, if anyone would be lame enough to write a song about a golf course architect. Watching Doak play links golf, it's no wonder why he builds his golf courses the way he does. The dude is a short-game maestro. I think he truly does see greensites like Neo. He is deadly from about 75 yards in, usually hitting a bump n run shot with his 7-iron. He surveys the land, takes a gander at the slope right around the hole, goes back to his ball, then takes some mini-waggles with an open stance. You can almost see his bionic brain churning through all of the physics equations involved. Then he pops the ball and it always seems to take the contours the right way, propelling up any slope with just enough pace left over to finish within four feet of the hole. He's just as deft with his old-school putter, dying the ball at the hole from the high side like his good friend Ben Crenshaw. Only a surprising miss from 4 feet on the last hole kept him from posting a 79. Still, it was an impressive showing and extremely fun to watch. We had played the Old Course in about two hours and five minutes. If I hadn't been so busy hacking it around on the back nine, we might've finished before the rains had come down. We had gotten the full assortment of Scottish weather before 8:30 AM, and we ended up finishing the last three holes in a pretty steady downpour of fat, round raindrops. Because our rounds were spaced three hours apart, we had plenty of time to get dried out and get geared up...except by the time we reached the first tee of the Eden course, the rain had completely stopped. Welcome to Scotland. The Eden course, designed by Harry Colt, is a fun and sporty course with some good birdie opportunities. It is also personally noteworthy as the 150th course I've ever played back in 2000 (yes, i keep track of these things...I'm up to 343 now.) I decided that I needed to slow my swing down to about a third of its previous speed and start trying to hit golf shots. I was already beginning to feel like the fourth wheel, trying to keep the group score (and often falling 3-4 holes behind), usually hitting last off the tee and thus giving my partners a 25-30 yard head start down the fairway. With 180 miles already on the odometer and a minor foot injury sustained while running on the 8th hole on the Old Course, there was little chance of me catching up. With the wind blowing, I rarely could hear the conversation my partners were having - at one point, I know Simon told a great story about Donald Trump, but I missed about 90 percent of it. Sometimes Doak would turn his head my direction and make some comment -- for all I know, he could've been revealing his deep, dark design secrets, but all I could do is smile and nod like I understood what he was saying. My only hope was to start hitting some greens in regulation. I ended up with my best round of the day, a 40-40 80. Simon turned from caddie to track coach, and had us practically sprinting down the last hole to finish under two hours. From the Eden, we went to the Strathyrum next door, another shortish course that was seemingly ripe for the taking. The Strath is billed as a "friendly introduction to links golf". I'm billing it as an "unfriendly introduction to the agony of the four putt". Similar to my quintuple bogey, I had managed to go this entire saga without a four jack, then I had two of them in a three-hole span, both coming from rushed putts missed from less than a foot away. The first was painful, as it came on a par 3 that I nearly aced, my shot landing short and left of the green, bounding then rolling right towards the cup, then disappearing behind the flagstick for a nanosecond before scooting about eight feet by. From possible ace to implausible double bogey just like that. "You need to work on your shorties," Simon quipped. Doak, on the other hand, continued his strong play, and growing in confidence, actually started overpowering the Strath course. He had some good eagle looks and was hoping to pad the stats with some "cheapie birdies". Interestingly, Doak had generously made a pledge in support of my hike, with a per-birdie kicker. He added the note, "You can make as many birdies as you want at Ballyneal, as long as you don't make more than me at St. Andrews." At the time, I thought nothing of it. I was humming along with 28 birdies and an eagle through 449 holes. Certainly, I get outplay and out-birdie Doak on the day, right? Wrong. Doak's 78 bested my 82 at the Strath course, and he was beginning to pull away on me on birdies and score. Links golf had exposed the weaknesses of my game, and I couldn't keep up with Doak's short-game wizardry. To top it off, after nearly every birdie that I did get, David would roll one in right on top of me. It was uncanny. However, the most humbling moment of the day didn't come on the golf course, though one might think a 97 on the Jubilee course that I'm just now taking editorial liberties to gloss over would do the trick (at least Tom shot 97 as well, though he did have the shot of the day on number 9, hitting a 5-wood to about two-feet in a 35 mile per hour crosswind.) No, I was cut down to size after the round, as we sat in the clubhouse resting before our last full 18 on the New Course. I was sitting at a table with Doak, attempting to add up the carnage on our scorecards. Tom, busy nursing some blisters, took one sideways glance at the scorecard, then faster than Rain Man could count fallen toothpicks, said, "so, I had a 44 on the front." I was floored. Not only has this guy seen and played nearly every great golf course in the world. Not only has he forgotten more than I'll ever know about golf course architecture. Not only was he taking me to school on the golf course. He's going to out-math me as well? Do I have to spend the rest of my career looking over my shoulder, wondering if he's going to barge in the office and start building better capital models too? Well, if you can't beat 'em, join 'em. For our round on the New Course, I proposed that we play a fourball match with the logical teams being David & Josh (Team St. Andrews) versus Tom & me (Team Solich Academy). After the grind on the Jubilee and the miles and hours starting to wear on us, plus with no real sense of urgency left -- 100 was a foregone conclusion, a match would be a welcome change of pace. And of course, I was hoping to harness some of the match play magic that I had at Cabot Links, where I waxed my buddy Harris 4&2 in my seventh round (his second). Early on, it was all going as planned. I birdied the opening hole, and parred the third to give team Doak & Dork a 2-up lead. From there, it was a see-saw battle. David birdied the 4th hole to get it to 1-up, then it was all-square after six. Doak's game had deserted him, and I was forced to try and carry the team, not exactly my strong suit. We won the 8th hole, then Josh, who had struggled for most of the day, came alive at just the right time. All four players found the green on the majestic uphill 9th, but only Josh found the bottom of the cup in two. We responded by winning the tenth, but David squared the match again with a birdie on the 11th. We pulled ahead on the 14th, then Josh, playing with a loaner driver from David, finally figured out his timing and started crushing the ball. The closing holes were playing into a tough right-to-left wind, never my thing, and I was faced with having to hit clutch shots off the tee. One blocked shot, which admittedly was very likely at the moment, and the match would've been effectively over. But I was able to pull off the bunt drive that Schulte taught me back at Ballyneal, and on the 15th and 16th holes, was right next to Josh in the fairway. And on both holes, I failed to hit the green from total green light positions. I'm still dumbfounded. There was still hope though. On the 16th, with the match all-square, I found the pot bunker short of the green. By this time, our old friend Ben was done with his shift as the starter and decided to join us the rest of the way. He was doing his best to boost my confidence and will a par out our team down the stretch. I hit a bunker shot that Ben called "Mickelson-esque"...unfortunately my 5-foot par putt that slid right on by and incredulous reaction reeked of Phil as well. All of a sudden, we were one-down with two holes to play. The 17th hole on the New is a tough 211-yard par 3. Tom, Josh and I all hit tee shots that leaked left and ended up bouncing into the tall grass. David missed the green but was in good position to make 3. Either Tom or I had to make a par. Only about 25 feet away, but to a pin tucked just over a steep slope, our work was cut-out for us. "This is a tough place to try to get up and down," Tom admitted. "If he's already thinking that, then what chance do I have?" I thought to myself. Tom hit first and hit a decent shot, the ball scooting up the slope a little bit and ending up on the front of the green, about 10-12 feet from the hole. I knew I had to do better. I opted for the chunk and run with my lob wedge, and judged it just right. The ball rolled up over the mound to four feet away. A clutch shot under the circumstances! Tom putted first and pulled his shot to the right. I was really, really hoping he would make it. I had a putt on a similar line and aimed at the right edge. I'm brutal with right edge putts, but was convinced it was the right read. I had been playing too much break for most of the day. There was no way this putt could break outside the hole. And of course it did. The putt curled sharply to the left by the hole, and just like that, the match was over. A 2&1 victory for the home team. I don't think Doak will be asking me to be his Ren Cup partner anytime soon. The silver lining was the match was a blast and, more importantly, it had the desired effect of creating a much-needed distraction to get us from hole 82 to hole 99. Now, it was back to the Old Course to finish it off. 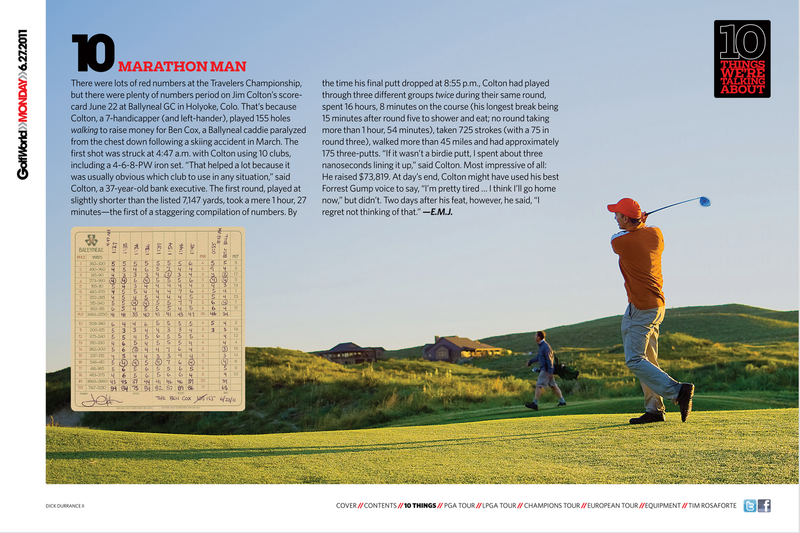 At one point, very early in the day, we joked about sprinting down the first fairway to see who could finish the hole first, something Tom had done once out at Ballyneal. Hours later, there was an unspoken pact not to bring up that idea ever again. Hitting into a bright, setting sun, we teed off one by one. Doak. Evenson. Watt. And finally Colton. My drive was sliced badly, but thankfully there is a ton of room. My ball rested about 10 feet from the out-of-bounds stakes on this 110-yard wide fairway. Both David and I hurried to hit shots towards the first green while golfers on 18 tried to hit their closing tee shots. A couple minutes later, we were putting out as a group for the 100th and final time. On the first green of the most historic golf course of them all. At that point, it didn't really matter what the scores were. It didn't really matter that I violently lipped out a 25-foot putt for par (but it still stings a little). We went into the day not really knowing what to expect, and 15 hours later, we were at the finish line. I made the final putt, and it was handshakes, smiles and hugs all around. While Tom, Josh and David all now had a nice round '100' next to their name, I was sitting at a somewhat awkward '549'. It just didn't seem right to end then and there. So I walked over the 18th tee, approached a nice family that was just coming off the Road Hole green, and said, "Excuse me, I just finished walking 549 holes for charity, do you mind if I join you for this last hole to make it a nice round 550?" They kindly obliged my request and I hurriedly hit one right down the middle. They were a nice family from South Africa, and had quite a posse of their own. Father. Two sons, roughly ages 13 & 17. And Grandma (she could rip it) all played. Mom and two sisters walked along, undoubtedly recording the day with 1,000 pictures. As they stood on the Swilken Bridge for the obligatory picture, I couldn't help but think that THIS is what it was all about. This was the very heart of golf. Links golf brought this out in people. Links golf is what binds us. If you couldn't help but laugh and smile at St. Andrews, no matter the weather, no matter the score, then maybe you should be taking up another game. A lot had happened to me since I last stood on that bridge in 2000. I had just gotten married and was only a few years into a career. A couple years later, we had our first of three kids. My game ebbed and flowed. Sometimes I loved it. Other times, I hate to say I hated it. I really struggled to find the right balance between golf, family, career and faith. The Old Course was an experience, for sure, but I don't think I quite understood what it meant at that time. In contrast, over thirty years ago a young Tom Doak walked these same hallowed grounds. He knew what he wanted to be. He just didn't know how it was going to happen. But living and working in the town, he understood what I didn't get until I was staring at three generations of random South Africans. Doak got it and set out to spread the age-old principles of the Old Course to others, notably to U.S. golfers who had been inundated with target-golf, cart-ball, real-estate driven clones. One of the courses Doak built was Ballyneal, my home away from home and one of the truest links golf experiences in the U.S. It's not hard to see the great circle of life here. Doak lives at St. Andrews. Doak builds golf courses. Doak builds Ballyneal. Colton joins Ballyneal. 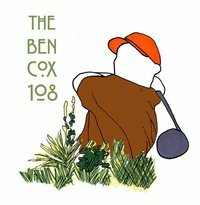 Colton meets Ben Cox, walks a lot of holes for him. Colton forms Hundred Hole Hike. Colton hikes with Doak at St. Andrews. One more time...how the heck did this happen? I'm not exactly sure, but I sure hope that it happens again. In the meantime, I'll be practicing my 7-iron bump and run. Note: I walked 550 holes for charity as part of the Hundred Hole Hike, a charity golf event that I founded in 2012. I am raising money for the Solich Caddie & Leadership Academy in Denver and the Evans Scholars Foundation. If you'd like to support my hike, please go to the link below and click on any one of the "Pledge Thru Me" buttons on the page. Also, please review any of the 84 other hikers participating for a variety of worthwhile causes.